Salina Schultz, 1828 [G6939] - $9.00 : Yarn Tree, Your wholesale source for cross stitch supplies. Cross stitch pattern from Carriage House Samplings. 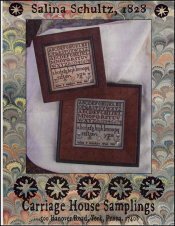 Alphabet sampler with floral motifs. Stitch count 102w x 94h.